Nick Cave was wearing a remarkable shirt. Dozens of hands pawed and pulled at its shiny gold fabric, twisting and tugging at its folds, but always it snapped back into place — slightly misshapen from the adoring caresses of Cave’s fans, but never torn. It was Friday night, June 20, inside the Milwaukee Theatre. It was the first time Nick Cave & the Bad Seeds had ever played a headlining gig in Milwaukee. Throughout all of this seduction, Cave delivered his sardonic, sinister and sublime lyrics in his baritone — beckoning, boasting, pleading, wooing, warning, threatening, musing, narrating, shapeshifting — as the Bad Seeds kept on playing tense, spooky chords on the stage behind him. For some reason, Cave isn’t making a Chicago stop on this tour. On Thursday night, I decided to buy a ticket for the show in Milwaukee. The opening set by Warpaint was fairly entertaining, though it paled in comparison with the fantastic performance that followed. After sitting in the mezzanine for a couple of songs, I followed other fans to the front of the auditorium, where people were standing in the aisles close to the stage. 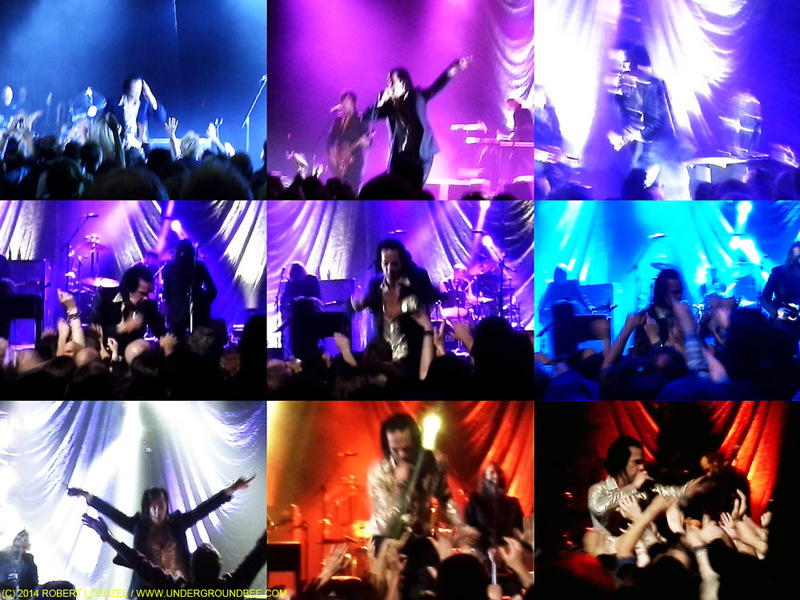 I did not have my camera with me, but I snapped a few blurry, grainy pictures with my cellphone. The collage of those images at the top of this blog post is the best I could manage under the circumstances. Like last year’s concert at the Chicago Theatre, this one featured several songs from Cave’s most recent album, Push the Sky Away (my favorite record of 2013). And of course, the Bad Seeds played several of the old tunes that are staples of their concerts, like “Red Right Hand” and “Tupelo.” So in many ways, this 2014 concert was similar to that 2013 show — and yet, it all felt more intense. Push the Sky Away is a brooding record with few moments of outright catharsis. The band seems to be holding itself back throughout the haunting, riveting set of songs. That restraint is part of makes the record so compelling. But in concert, the songs take on a new life. One of those songs, “Jubilee Street,” became more thrilling and dramatic when Cave & the Bad Seeds played it last year. And this time, the drama doubled yet again. It was only the second song of the night, but when Cave reached the climatic words — “I’m transforming, I’m vibrating, I’m glowing, I’m flying, look at me now!” — he repeated them over and over as the Bad Seeds riffed harder and harder, stretching out the song by several minutes as Cave worked the crowd, bending down to let those outstretched fingers touch him. Later, at the end of the main set, Cave descended from the stage and sang one song out in the midst of the audience. For this intimate moment, he chose the hushed, ghostly title track of Push the Sky Away. When Cave returned for the encore, he played four songs, and it almost seemed like he might keep going longer. At an earlier point during the concert, after an especially wild guitar solo by the multi-instrumentalist Warren Ellis, Cave introduced Ellis, the most prominent musician in the Bad Seeds. But Cave never introduced the rest of the band members. It didn’t feel like a slight, however. Gesturing at the musicians assembled behind him, Cave simply said, “The Bad Seeds.” What more did he need to say, really?